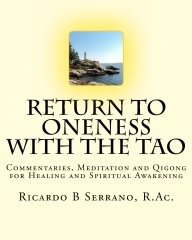 The second book Return to Oneness with the Tao elaborates on the Taoist meditation and Qigong inner alchemy techniques such as lower dantien breathing, Microcosmic Orbit Qigong, primordial wuji Qigong, meditation on twin hearts, and Tibetan Shamanic Qigong to cultivate the Three Treasures Jing, Qi and Shen. An important addition to this book is the understanding of a most important principle – awareness and intention are powerful factors for personal transformation and healing. When we are aware of what is – the emotional root cause of disease that is blocking the flow of Qi – we can intentionally release it through meditation and Qigong to effect a process of change for personal transformation and healing.